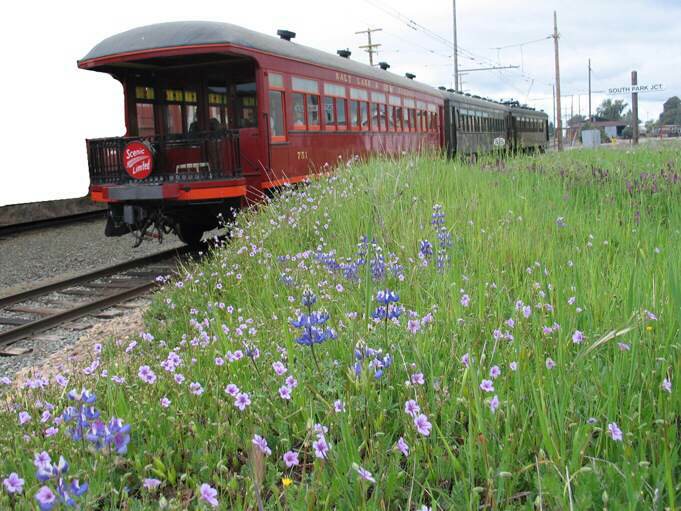 The Vintage Comet Wine Train is once again returning to the Western Railway Museum in April to give wine enthusiasts and wildflower lovers in Solano County and beyond the chance to experience wine, history and nature on its historic electric railway. Every Saturday in April, the Vintage Comet will depart at 4 p.m. for a 75-minute, 11-mile ride in the stunning late-afternoon light. While admiring the views of the native wildflowers that cover the hillsides and fields, passengers 21 years and over will be able to sample and learn about four area wines from members of the Suisun Valley Wine Co-op. Juice will be available for patrons under 21 or those who prefer non-alcoholic beverages. Suisun Valley is the second oldest American Viticultural Area in California, behind only Napa, said Phil Kohlmetz, the executive director of the Western Railway Museum. This area just outside of Fairfield is the next major valley east of Napa and is best known for Petite Sirah, Merlot and Cabernet Sauvignon. Kohlmetz went on to describe the Vintage Comet Wine Train as a “true experience for Solano County.” In addition to members of the wine co-op, museum docents will be on hand to describe the various native wildflowers in bloom and visible from the rail line, which is part of the Sacramento Northern Railway National Historic District. The entire experience is very home grown, Kohlmetz explained. With this being just the third year of the wine train, it continues to grow and expand. The name Vintage Comet references wine and history and also honors an actual Sacramento train name, “The Comet,” which ran from Oakland to Sacramento over the tracks the museum now owns and operates. The Vintage Comet also features an antique parlor-observation car that turns 100 years old this year. 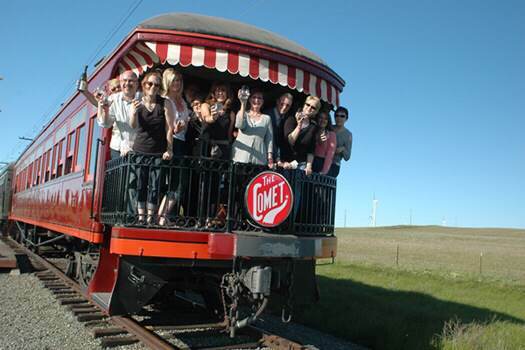 The Vintage Comet Wine Train will depart every Saturday in April, from April 5 to April 26, at 4 p.m. Tickets are $25 a person and include a souvenir wine glass. A portion of the ticket price benefits the Solano Midnight Sun Foundation, which provides temporary financial assistance to women battling breast cancer. Advanced reservations are accepted at www.brownpapertickets.com or by calling 1-800-838-3006. While children are allowed to ride the Vintage Comet Wine Train, parents looking for a more family-oriented experience with their kids are encouraged to ride the Scenic Limited, which departs three times a day on Wednesdays, Saturdays and Sundays. Coach tickets are $10 for adults, $9 for seniors 65 and older and $7 for children between the ages of 2 and 14. First class service is an additional $6 per ticket. All riders will receive cookies and lemonade. The Western Railway Museum is located on Highway 12 in rural Solano County, midway between Interstate 80 in Fairfield and Rio Vista in the Sacramento Delta. It is located just one hour from a number of major cities and communities, including San Francisco, Sacramento, Stockton and Sonoma.